It is that time of year again, when the two-spotted spider mites (Tetranychus urticae; TSSM, Figure 1), and other mite species, show up in full force and wreak havoc on fruit and vegetables. These pests are very inconspicuous and often go unnoticed until the resulting damage appears. For TSSM this includes the webbing produced on heavily infested leaves or to the more trained eye, the characteristic yellow speckles or mottled symptoms on the upper surface of the leaves (Figure 2 and 3). The mites can be found on the underside, feeding with their sucking mouthparts. Figure 2. 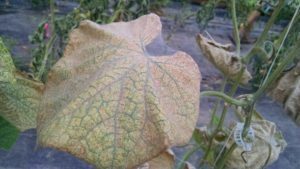 Yellow speckles on the upper surface of cucumber leaves heavily infested by two-spotted spider mites. Figure 3. Webbing produced on heavily infested cucumber leaves by two-spotted spider mite. If the infestation of TSSM is at the point where webbing is visible on some leaves, especially in high tunnels, chemical intervention is necessary before introducing beneficial predators. There are a variety of miticides that have been effective in the past, leading to control with only one application. We have used Portal® in the past, which has since been prohibited in greenhouses. Ones that are currently silent on the label, and therefore may be used in high tunnel production depending on your local interpretations, include Acramite®, Agri-Mek® and Oberon®. 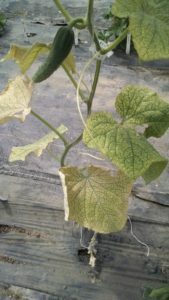 These products can be used in both cucumber and fruiting vegetables. An organic alternative may include various insecticidal soaps, which kill on contact so should be carefully applied to the underside of leaves where the pests are feeding. If you are considering beneficials for control, there are a variety of predatory mites and a midge available for purchase. Phytoseiulus persimilis is a predatory mite that only feeds on TSSM and can be effective at getting an outbreak under control. They become less active at temperatures around 90-95˚F. The predatory midge Feltiella acarisuga are available for purchase as pupae in plastic trays. They take about 3 weeks to establish in the crop and provide control of TSSM as well as other mite species. The larval form of this insect feed on the mites and can resemble syrphid fly larvae, which are common and feed on aphids. 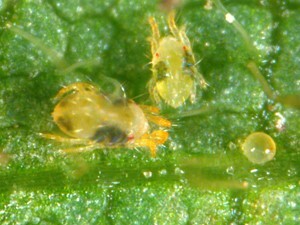 There are a variety of Amblyseius species, another predatory mite, that can establish and maintain long term control. The species that is most heat-tolerant and therefore suitable for high tunnels at this time is Amblyseius californicus. They remain active at temperatures up to 110 ˚F.